Como conecto mi cámara a una red wifi y mi visor a otra? We took a look at the logs. It turned out that you don’t have a Camera device yet! Could you check out this video tutorial and see if it helps? Please download Alfred on at least TWO devices, log in to the SAME Gmail account, and set them as Viewer/Camera. We took a look at the logs. It seems like you only have ONE device which is set as Camera. 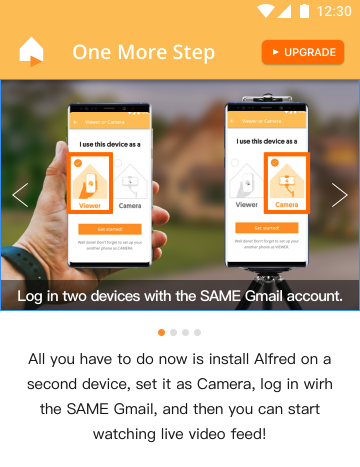 To use Alfred, you need to download the app on two devices. Please download Alfred on a second device, log in with the SAME gmail account, and set it as Viewer. You will be able to watch live feed instantly! Are we suppose to use diffrent gmail to open both camera and viewer ,or should I use the same gmail I use for viewer to locate viewer from camera ?